This deluxe CD version is housed in a digipak sleeve, includes a 20 page page booklet with rare photos, concert flyers, art work, and a new introduction from Luie himself which sheds some light on his original inspiration for the album. As an added bonus, two "Touchy" buttons are included! 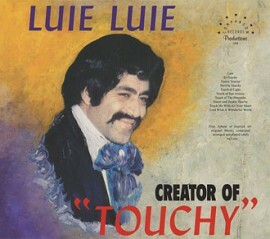 They are inspired by the original "Touchy" buttons issued with the original LP and read "Touchy Me Here."